Go, go Galileo! The Giove-A satellite has arrived in Baikonur ready for launch 28 December onboard Soyouz-Fregat. Giove-A is the 1st step in implementing Europe’s Galileo satellite navigation system, which will ultimately comprise a constellation of 30 satellites set to enter full operational service in 2010. 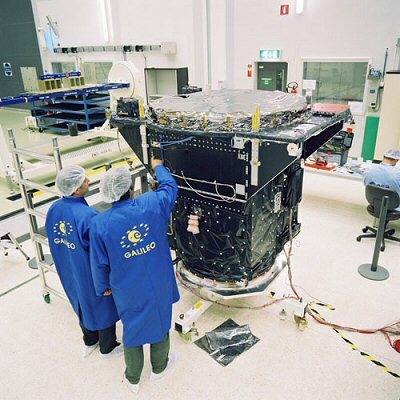 Giove-A1, the 1st satellite in the Galileo system, arrived a few days ago at the Baikonur Cosmodrome in Kazakhstan, where it will be orbited late this month by a Soyuz-Fregat launcher. Giove-A is a precursor satellite designed to perform in-orbit validation (IOV) operations for the Galileo constellation. Its twin Giove-B will join it in 2006. 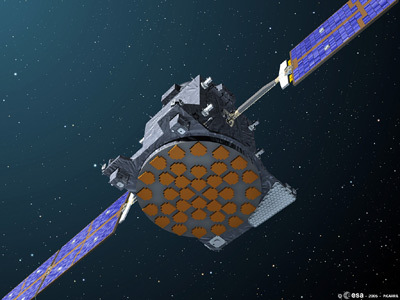 Together, the 2 precursor satellites will cover the 1st phase of Galileo IOV, during which they will test new technologies essential to build the full constellation. Characterize the environment of the medium-Earth orbit in which the Galileo satellites will be operating. After this 1st step, 4 satellites will be launched in 2008 to form the initial nucleus of the constellation. These satellites will validate the basic Galileo concept and ground segment, laying the foundation for the full 30-satellite system. The Galileo constellation will comprise 27 operational satellites and 3 on-orbit spares, in circular orbits at an altitude of around 24,000 km. Each satellite’s payload includes timing instruments (for example, atomic clocks), signal generators and signal amplification equipment. The upcoming launch of Giove-A will pave the way for development of a European satellite navigation system. Galileo, operating alongside the U.S. GPS2 and Russian Glonass3 systems, will begin delivering services in 2010 for a broad range of applications in many sectors, including air and road transport, shipping and agriculture.